Woking Golf Club was founded in 1893 and is the earliest of the now famous Surrey heathland courses. 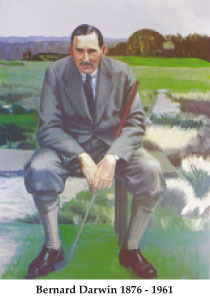 The initial architect, Tom Dunn, made excellent use of the gently undulating terrain and constructed a course characterised by carries over heather to fast running fairways and beautifully sculptured greens, full of character and deceptive slopes. While not long by today’s standards the course lends itself particularly well to foursomes matchplay, the format of the Darwin competitions. Bernard Darwin’s association with Woking GC was a long one for the club was very close to his heart. “I regard Woking, more than any other golf course, as my ‘spiritual home’…” He became a member in 1897, aged 21. He was Captain in 1908-09 and President from 1937 until he died in 1961. It is known that he personally gave permission in November 1958 for the Bernard Darwin Trophy to be played in his name. The schools represented have remained unchanged to this day. The course has been ranked by Golf Course Architecture magazine as one of their top 100 courses in the world and by Golf World magazine (2015) as number 62 in their top 100 courses in GB&I.